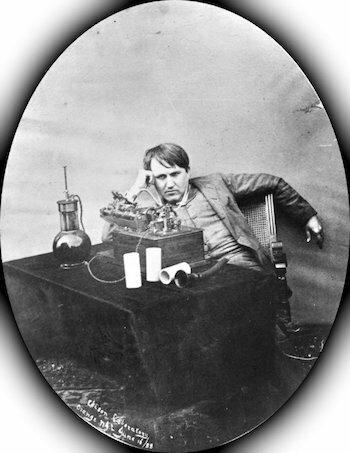 In 1920, Thomas Edison announced that he was working on a communication device which would allow users to speak to the dead. Edison's Telephone to the Dead was reported in American Magazine, and was apparently taken seriously by both the public and the magazine (though some later suggested Edison was pranking the press, and the entire thing was a hoax). A few decades earlier, the American public was swept into a Spiritualism Movement, lasting from around the 1840s to some time after the turn of the century. By 1920, Edison was one of the most famous men alive, and the news sparked a media sensation. While no prototype was ever manufactured, and no blueprints ever found, even Alexander Graham Bell's assistant, Thomas Watson, attempted his own version of a spirit phone. Radio had become prevalent, and news traveled fast. The telegraph and air flight had also only recently been discovered, so communicating with the dead was not beyond acceptable reason for the times. The audience later divided into camps, with some suggesting that Edison's Spirit Phone was a deliberate prank on the press, and others suggesting that Edison probably did pursue the project, despite no real evidence of having finished it. To-date, no device has been proven to communicate with the dead, but several attempts at "Spirit Phones" have been made. Thomas Edison died in 1931.